This week is a bumper time for storage with plenty of deals available at Dabs for storing and sharing files across your network. Network storage used to be an expensive option, but it's getting a whole lot cheaper. If you don't know what network storage is, it's a hard drive but it's connected to your network so it can be accessed by any computer connected to the network. Often they plug straight into your router. You might also hear them referred to as a NAS, which stands for Network Attached Storage. Synology has just announced its new easy-to-use and budget-friendly NAS for Home and small office users – and you can pre-order now for under £85. 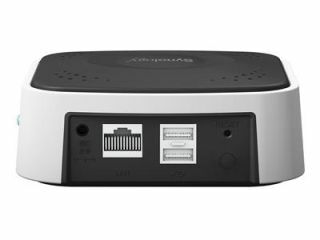 The Synology USB Station 2 enables you to share any USB hard drive over your network. That's not the only NAS deal we have for you this week - LG has just added its new 4-Bay NAS products to its expanding range of network storage solutions. The N4B2 range comes in three flavours – unpopulated so you can put in your own SATA hard drives plus 4TB and 8TB ready-populated options. The whole range runs on Intel Atom dual-core CPUs, and have built-in download, web and iTunes servers. Thanks to Seagate's FreeAgent GoFlex 1.5TB external portable hard drive, you can now carry 1,500GB around with you. This little beauty gives you an incredible amount of on-the-move storage for less than £150. There's also a great dabs.com deal this week on the Asus O!Play HD2 HD Media Player featuring the latest USB 3.0 technology for faster data transfers. As it also has an internal hard drive, it can also function as a NAS so you can share your files with other computers, too. It costs less than £110. Dabs also has a deal on the latest Asus Sabertooth X58 motherboard – the latest addition to its TUF series. The feature packed X58 Chipset board boasts USB 3.0, a fast 6.0Gbps SATA connection as well as a whole host of unique Asus features. If you're looking to get your hands on one, you can for less than £150. And if you're looking to upgrade your graphics card as well then look no further - the XFX ATI Radeon 5770 HD 1GB single slot card, which also featured in Dabs' CrossfireX bundle, is now also available on its own for under £112. It ships with a free copy of rally game Dirt2.